First of all, it is to be reminded that the Russian Federation was to have conducted an observation flight over the territory of the Turkish Republic on February 1-5, 2016 in accordance with the Treaty on Open Skies. A preliminary approval for the flight had been received from the Turkish party within the time limits prescribed by the Treaty. Yesterday a group of Russian observers arrived at the Turkish airport Eskisehir and submitted the route of the observation flight to Turkish representatives as it’s required under the Treaty. However, the Turkish Defense Ministry officials refused the Russian specialists to perform the observation flight over the areas adjacent to Syria, as well as over the airfields with concentrations of NATO aviation and without any specific explanation at that. Official NATO and Pentagon representatives who are always stand in solidarity with Turkey are to be reminded about something. Last year Western countries conducted 32 observation flights over the Russian territory on the routes designated by them within the Treaty on Open Skies. Turkey conducted 4 of them, including 2 – together with US military officials. No remarks or complaints about the illegal military activities of the Russian Federation were registered. Ministry of Defence of the Russian Federation does not intend to leave without proper attention and response the violation of the Treaty by the Turkish party. Such steps made by a NATO member-state do not contribute to the security and confidence-building in Europe. 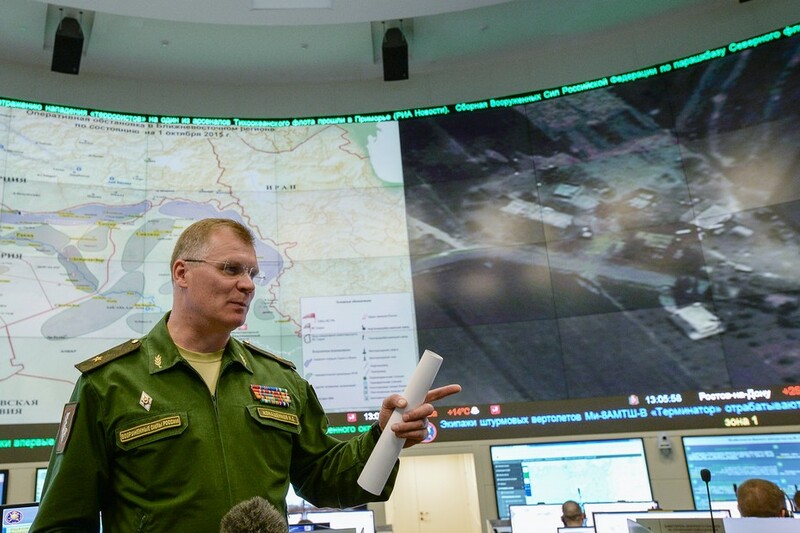 The Russian Defence Ministry regards these actions of the Turkish party as a dangerous precedent and an attempt to hide the illegal military activity near the Syrian border. Moreover, The Russian party has reasonable grounds to suspect intensive preparation of Turkey for a military invasion to the territory of a sovereign state – the Syrian Arab Republic. The Russian Defence Ministry has presented to the international community the incontrovertible video evidence which shows the Turkish self-propelled artillery shelling the Syrian inhabited areas in the north of Latakia. It is surprising that the eloquent Pentagon and NATO representatives as well as numerous Human Rights Organizations in Syria still remain silent about that despite our call to respond to those actions. Moreover, the Russian Defence Ministry registers a growing number of signs of hidden preparation of the Turkish Armed Forces for active actions on the territory of Syria. It is to be reminded that the Russian Defence Ministry has intensified all kinds of intelligence in the Middle East region. That’s why, if someone in Ankara thinks that the prohibition of Russian observer flight allows to hide something, it is unprofessional. The Defence Ministry is to demonstrate another fact of provocative actions by Turkey on the border with Syria. Here is an image of checkpoint on the Turkish-Syrian border near Sarmada – Reyhanli. Terrorists, who captured Aleppo and Idlib in the north-west of Syria, are supplied with weapons and militants through this checkpoint from the territory of Turkey mainly at night. American and NATO-counterparts like to name these transport caravans with weapons for terrorists as “humanitarian convoys”. Journalists are just thrown in jail for trying to find out what is transported in these convoys in Turkey itself. The attention is to be paid to the first frame, dated October 26, 2015: there is a parking for heavy trucks and two small platforms on the Turkish and terrorists-controlled Syrian border side, which are generally empty during the day. Here is a second picture taken on January 30: someone has actively extended these platforms and even put them under protection. Moreover, the coverage of these platforms is very trampled. Maybe, in peace-time, these facts would indicate the expectation of trade turnover growth between the neighbouring countries. However, during war-time, in such a way the transport infrastructure is preparing on the eve of military intervention. And such platforms are used for supporting the rapid movement of military convoys carrying ammunition and weapons in the war zone, as well as for operational personnel deployment and evacuation. There are a lot of such examples on the Turkish-Syrian border, and especially since the presence of troops and military equipment. So, the prohibition of our observers’ flights by Ankara will not hide the illegal Turkish military activity in the region. In the course of the last three days, on February 1-4, aircraft of the Russian Aerospace Forces have performed 237 combat sorties engaging 875 terrorists’ objects in the Aleppo, Latakia, Homs, Hama and Deir ez-Zor provinces. As the result of the activities of the Russian aviation, terrorists are suffering significant losses. At the same time yesterday the Syrian Arab Army jointly with volunteer forces dislodged militants from positions and liberated the settlements of Nubul and Al-Zahraa besieged for over 4 years. Now leaders of illegal armed groups have to concentrate on evacuation of injured militants and to regain control over the situation. In the north of the country, the militants continue leaving their positions and retreating to the Syrian-Turkish border in order to keep the combat capability of their formations. According to the data received from representatives of the Syrian opposition, Jabhat al-Nusra Front and Harakat Ahrar ash-Sham militants have organized a unit of teenagers who had finished a special training courses in the Idlib province. The oldest “cadet” is only 16 years old and the youngest is 14. This unit is designed to be involved in terrorist attacks against civilians in Damascus, Homs and Latakia provinces. It’s necessary to stress that absurd allegations concerning alleged strikes of the Russian aircraft in the territories which had no sign of presence of the ISIS terrorists are now being disseminated again. These are mostly referring to the targets outside Raqqah, where the aircraft of the so-called anti-ISIS coalition supposedly do not conduct operations. Especially for those critics it is mentioned that throughout the first 3 days of this February,12 heavy bombing missions have been conducted by coalition forces in Aleppo, Homs, Raqqah, Hasekeh, and Deir ez-Zor provinces. Official representatives of the anti-ISIS coalition states are invited to inform the media concerning the results of this work. Especially concerning the Syrian inhabited areas. Just a couple minutes ago another Turkey representative claimed to share the materials on alleged violation of Turkish air space by a Russian aircraft. Currently no data has been received via military or diplomatic channels. Please be noticed that this is not the first fake report on that topic from the Turkish representatives.